Much in the spirit of Alan Moore and Kevin O’Neill’s “The League of Extraordinary Gentlemen,” the action-and-character-packed “Herald: Lovecraft and Tesla” manages to deliver on its ambitious promise. You certainly have a sense of urgency going on as we see Amelia Earhart running smack into her ill-fated destiny with key figures, Nikola Tesla, H.P. Lovecraft, and even Albert Einstein, determined to save her. Of course, Amelia would say that a woman doesn’t need any saving! All this glorious activity, written by John Reilly, is brought into a crisp clarity by the pencils of Tom Rogers. And then that is given a warm glow and finish by Dexter Weeks in charge of inks, coloring, and lettering. The new trade paperback collects the first three issues to this six-issue series, published by Action Lab Entertainment. This is exactly what you would hope it would be: a faithfully realized adventure mashup with a steampunk energy running throughout. You don’t just get all the famous players lined up or lounging about. They’re really walking and talking characters and substantial references are made to who they are and what might motivate them to travel in similar circles. Well, in this case, truth can be stranger than fiction. For instance, the real Nikola Tesla actually did hang out with Mark Twain. Thankfully, the narrative picks up on some essential truths, like the fact that Nikola Tesla, despite his brilliance, was taken to the cleaners by Thomas Edison. Or the fact that the athletic Harry Houdini was actually friends with the intellectual Lovecraft. These choice bits of factoids are treated lightly and smoothly. We also don’t waste any time in getting to a free-wheeling fantasy, particularly the romantic pairing of Tesla with Earhart. You have to have these two together for the rest of the story to work. 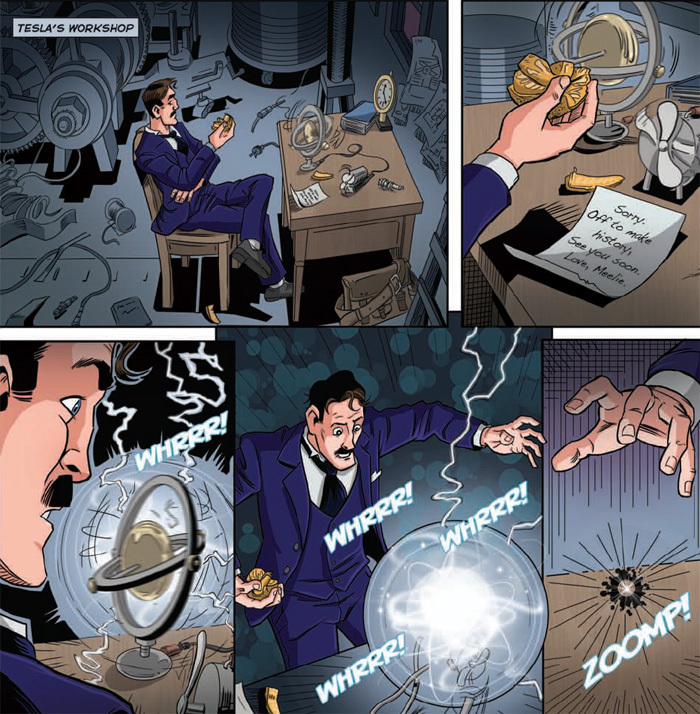 It’s Earhart who somehow gets caught up in swiping one of Tesla’s experiments. And this leads to the big chase that slides into confrontations with ancient gods, secret societies, strange technologies, and even occultist Aleister Crowley. Hats off to Tom Rogers for his spirited depictions of everyone involved and his dynamic handling of settings. He has quite an energetic style that mingles a tight adherence to details with a lively effortless quality. He really enjoys bringing in an intense angular look to his people and places. What Rogers makes look bold and smooth, might turn out stilted in a lesser talent. So, there, you’ve got a very solid creative team all working together on something special, something that I can actually get excited about. If you happen to be Beaverton, Oregon, this Wednesday, July 1st, stop by the Things From Another World comics shop to see Tom Rogers in person as he’ll be there signing from 3:00 to 6:00 p.m. To RSVP and check out more details on that event, go right here. And visit our friends at Action Lab Entertainment right here.